Aizawl, Apr 23 : Consumption of pork in Mizoram and Manipur has become less in Mizoram and Manipur following the outbreak of swine flu. In Manipur, veterinarians are still investigating the reasons for the death of pigs in large number at Heingang Chonthabi and Luwang shangbam areas of Imphal East district following the reports made in local newspapers. However, in the case of Mizoram, doctors have confirmed it as ‘Classical Swine Fever’. Imports of pigs from Myanmar to Mizoram has been restricted following the outbreak of the swine flu. Restriction on selling of ‘affected pork’ by the administration continues in the state capital Aizawl for the past one month and this restriction will continue till May end. Owing to the spreading of flu among the pigs in Aizawl area in the past one month which has been proved to be ‘Classical Swine Fever’, the Sub-Divisional Magistrate, Aizawl Sadar Sub Division, Aizawl here has been imposing certain restrictions regarding selling of pork in the market and related activities. 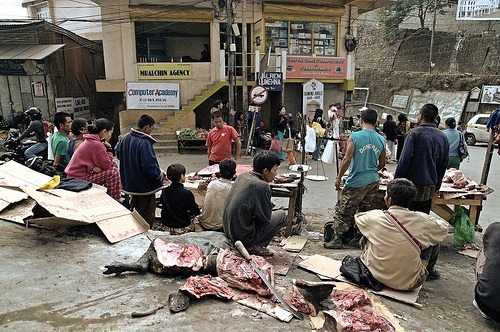 As the news of the spread of pig flu spread, the denizens of Aizawl have started avoiding their delicacy. The sales of pork also dropped rapidly. Chicken and beef have been substituting the menu in marriage feasting these days. As reported earlier, taking advantage of the situation, the dealers have hiked the price of chicken. Prior to the detection of the swine flu chicken (dressed) was sold at Rs 180 per kilogram but these days it has risen to Rs 250 or more a kilogram in Aizawl. The ‘Classical Swine Fever’ was detected after examination at Laboratory of College of Veterinary Science & Animal Husbandry in Selesih last month.